Rosemary McDaid, or “Rosie,” was born Rosemary Pestarino in Santa Clara in 1947, the third of six children born to her parents, Angelo and Lucille. She moved to Foresthill in Placer County in 1974 and lived in the same house until her death on January 31 at sunset. 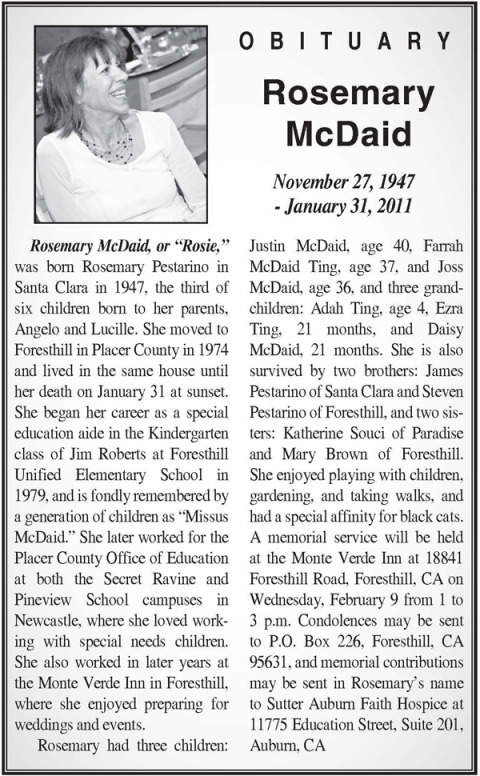 She began her career as a special education aide in the Kindergarten class of Jim Roberts at Foresthill Unified Elementary School in 1979, and is fondly remembered by a generation of children as “Missus McDaid.” She later worked for the Placer County Office of Education at both the Secret Ravine and Pineview School campuses in Newcastle, where she loved working with special needs children. She also worked in later years at the Monte Verde Inn in Foresthill, where she enjoyed preparing for weddings and events. Rosemary had three children: Justin McDaid, age 40, Farrah McDaid Ting, age 37, and Joss McDaid, age 36, and three grandchildren: Adah Ting, age 4, Ezra Ting, 21 months, and Daisy McDaid, 21 months. She is also survived by two brothers: James Pestarino of Santa Clara and Steven Pestarino of Foresthill, and two sisters: Katherine Souci of Paradise and Mary Brown of Foresthill. She enjoyed playing with children, gardening, and taking walks, and had a special affinity for black cats. A memorial service will be held at the Monte Verde Inn at 18841 Foresthill Road, Foresthill, CA on Wednesday, February 9 from 1 to 3 p.m. Condolences may be sent to P.O. Box 226, Foresthill, CA 95631, and memorial contributions may be sent in Rosemary’s name to Sutter Auburn Faith Hospice at 11775 Education Street, Suite 201, Auburn, CA.